Facebook, the social networking giant has held users offering exciting user interface designs very often. On the back end, facebook is popular in providing the best facilities for its employees even bagging the best employer award for many years. Facebook also encourages its employees’ creative ideas and tries to implement them. 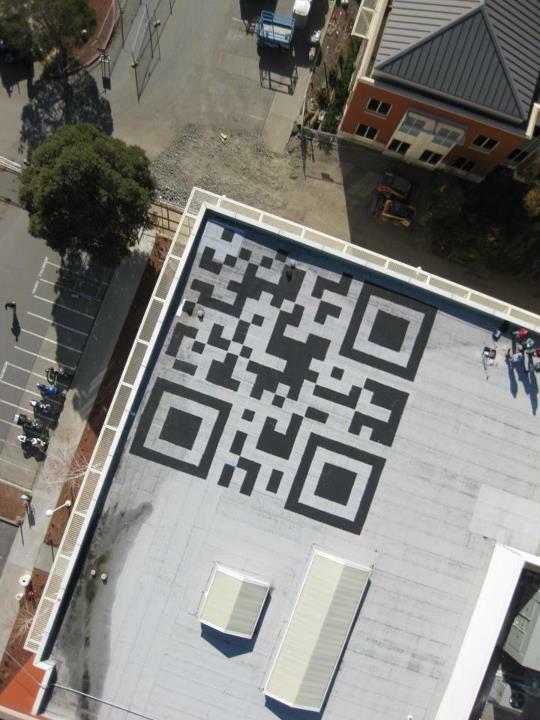 One of such employee’s creative ideas was to have QR code on the building roof and it has to be visible from the space or at least by the flight. QR code comprises of black shades on white back ground, scanning those can yield the hidden text, image or URLs present. If the URL length is more the QR code will be more complex and the short URLs will have much simpler QR codes. Mark Pike, an employee of Facebook planned (actually it is his brain child to have the code) to paint 42 foot QR code on roof of Facebook head quarters new building. He along with his friends was able to do so painting manually on the top of building. The QR code present on the building will redirect to a short URL fbco.de which was in fact registered to keep the QR code simple. The QR code present on facebook building will redirect to a website which is now under construction, in future will have the puzzles and mind challenging games according to the facebook release. Someone travelling on the flight above this building can scan and identify it as facebook’s head quarters and also can play few games on that site. No wonder even if astronauts travelling to space can be able to identify the facebook building from the outer space!